I thought I should post a warning here since the seller, hannah71783, still has a number of games listed on Ebay, including several 3DO games. 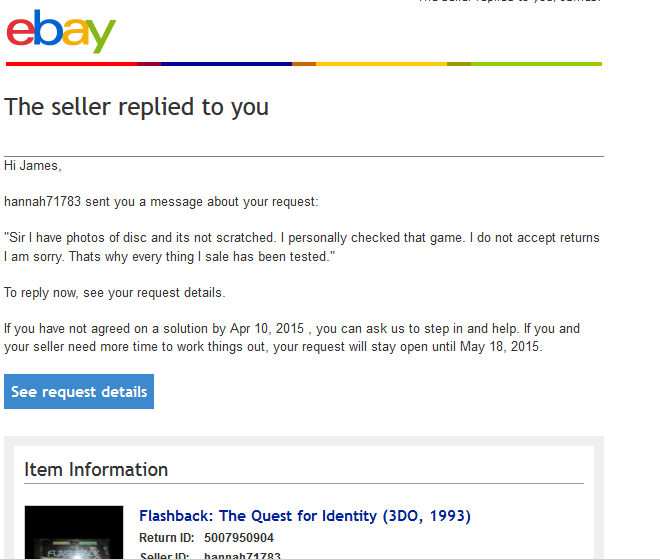 As I posted on these forums, I recently purchased a copy of the 3DO version of Flashback. When I took it out of the package I noticed it had several scratches, but assumed they wouldn't affect gameplay. Last night I tried the game out, only to find it is non-functional. I booted up my 3DO six times, and every time it crashed when I selected Start. Looking over the disc, I realized that the scratches were deeper than they seemed at first glance. Just to see what would happen, I tried it out on 4DO; 4DO crashed as soon as I loaded the disc. Note that despite her insistence that she does not accept returns, the game was not listed as being sold "as is". To add insult to injury, there's the horrendous grammar, as though she can't even be bothered to type up a coherent response for every single buyer she's swindling. Definitely the worst Ebay experience I've had in years of using the service. You should be able to get your money back by filing a case. It's time consuming (Wait two weeks to be eligible to open a case; then, it takes about three weeks after that, maybe less). If that doesn't help, at least negative feedback will help put the seller in her place. There's a lot of stigma about leaving negative feedback, but I'm of the mindset that sellers like this won't change their ways if you don't leave it. She seems like a careless individual, or has really low standards when it comes to condition ("Oh, a few scratches? Nah, that's not scratched.. List it as 'clean/mint'!"). Completely crap, non cooperational negative response. "I have photos of the disc". I'm sure she does. I too was burned with a pal need for speed. Condition of box and manual were superb and when I contacted the seller he was courteous and offered a refund but as condition of manual and case were excellent I decided to try and just have disc cleaned in local GAME store. Still can't watch every cut scene but it is now playable and maybe one day I will pick up a loose disc to replace it but least guy offered refund. Did you get any further with this? Dr.Enceladus wrote: I use a plastic polish to clean up any scratched music or gaming discs i come across. Its an ABRO product i picked up from my local hardware store used to restore perspex on headlights of cars. Works alright. After i clean it all back i'll wipe it over with isopropyl alcohol. I have varying degrees/levels of plastic polish I use on plastic ramps on my pinball machines, but I never thought about applying it to scratched discs. Hm, I'll have to try that sometime.